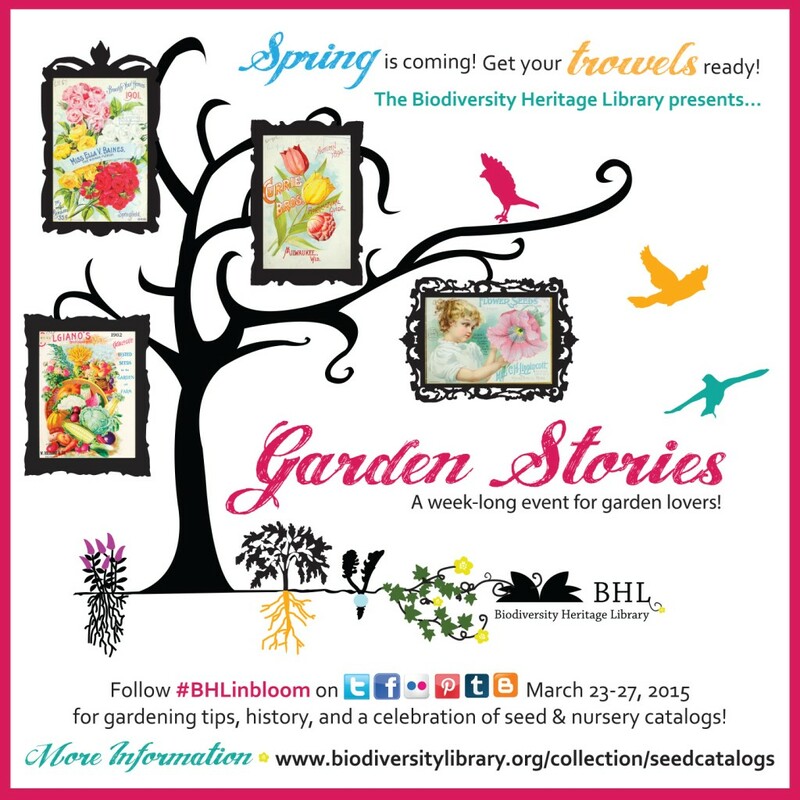 “Garden Stories” is a week long social media event for garden lovers from the Biodiversity Heritage Library. The campaign will explore the fascinating world of gardening, from the rise of agriculture to the home garden and the mail order gardening phenomenon. 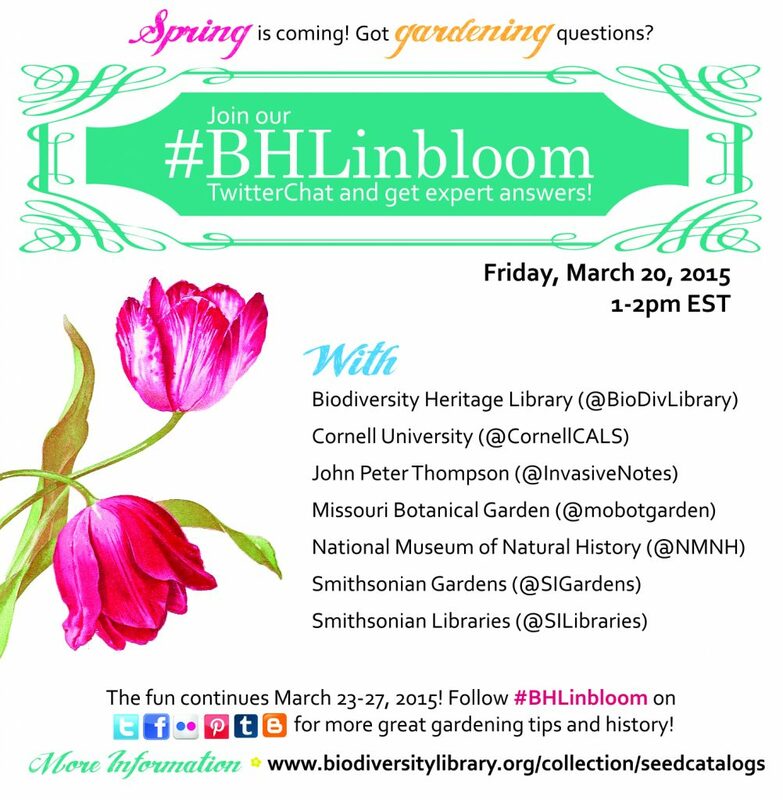 Celebrating the history, science, and art of gardening, content will be published via the BHL Blog, Twitter, Facebook, Flickr, and Pinterest, with additional posts through the Smithsonian Libraries’ Tumblr. The campaign will kick off with a TwitterChat on Friday, March 20, from 1-2pm EST. During the chat, you’re invited to submit your gardening questions for experts to answer. Botanists and horticulturalists at BHL partner institutions, including Smithsonian Gardens, Smithsonian Libraries, National Museum of Natural History, Missouri Botanical Garden, and Cornell University’s College of Agriculture and Life Sciences are participating by answering questions and providing gardening tips and resources. Follow along and join in using #BHLinbloom on Twitter. The Smithsonian Libraries is excited to take part in the chat! Our “voice” for the event will be Robin Everly, branch librarian at the Botany and Horticulture Library. Robin is looking forward to fielding your questions and sharing great gardening resources with you. For more information about gardening, including tips and plant factoids, be sure to check the BHL blog during the “Garden Stories” campaign. They will feature posts highlighting topics such as heirloom gardening, marketing and artistic revolutions in the gardening industry, and historic technological and garden fashion trends. To tell these stories, they’ll be pulling from the over 13,000 seed and nursery catalogs in BHL.This collection of seed catalogs is an impressive resource in its own right. A treasure trove for the garden lover!